We are a leading supplier to the DIY & trade such as local electricians, holiday camps & caravan parks, amusement arcades, pubs, hotels and other small business within a 25 mile radius of Caister on Sea. A profile of Caisterelectrical.co.uk was found on the social network Facebook. The web server used by Caisterelectrical.co.uk is run by Fast2host Ltd and located in Great Britain. On this web server 54 other websites are hosted. The language of those websites is mostly english. 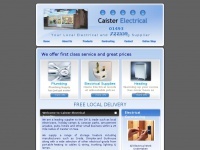 The webpages of Caisterelectrical.co.uk were developed using the programming language PHP. For managing the data of the webpages the CMS WordPress in the version 4.9.5 is used. The website uses the latest markup standard HTML 5. The website does not specify details about the inclusion of its content in search engines. For this reason the content will be included by search engines.